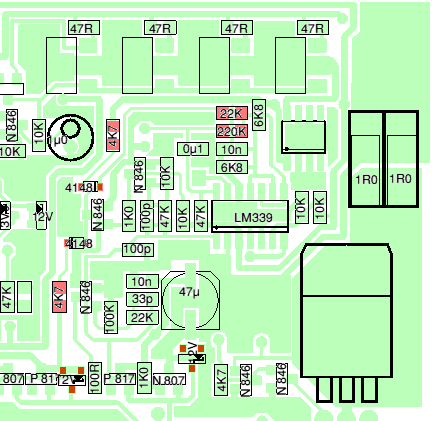 The circuit of the Pro-150 is available as a pdf. Current limit amplifier is in the bottom right corner. Current is monitored by sensing the voltage drop across the lowside MOSFETs when they are conducting. 5v is applied to the potential divider R15, D1, D2, R44 and Rds where Rds is the effective resistance of the lowside MOSFETs. D2 is necessary because the voltage across Rds is switched between zero and full supply. D2 blocks the high voltages. D1 is there as thermal and voltage compensation for D1. Q8, Q9 and their circuitry switch the sampling on and off so the samples are only effective when the MOSFETs are properly conducting. IC1d is an inverting peak detector, so the voltage on pin 14 is an analogue of the voltage developed across the MOSFETs. With the values shown, current is limited to about 50 amps per MOSFET with the AP95T07AGP MOSFETs used, which have a cold Rds of 4.8mOhm. Gain can be altered by altering R17 and R19. Higher gain (increase R17 or decrease R19) will result in a lower current limit. The components mentioned are highlighted in pink on the diagram. Be aware that a MOSFET’s Rds is temperature dependant. So doubling the gain will not halve the current limit. At half the current, power dissipation is reduced by a factor near the square of the current so the MOSFET will be cooler, so its Rds will be lower. So doubling the gain will reduce the current by a factor greater than two. It is also possible to disable one or two MOSFETs by cutting the gate tracks and linking the MOSFETs gate to source. The gate tracks are however somewhat inaccessible: it would be necessary to remove some of the main capacitors to access the track involved. As the are 3 MOSFETs this would give current limits around 50 and 100 amps with 2 or 1 MOSFET disabled.